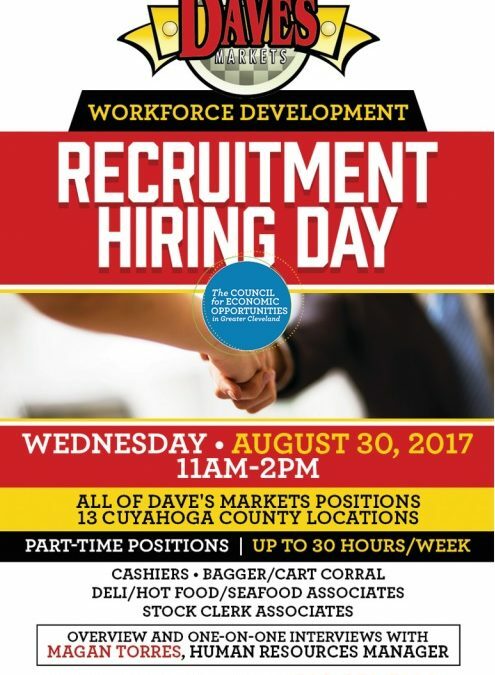 CEOGC and Dave’s Supermarket are teaming up for a hiring event next week. Dave’s Human Resources Director, Magan Torres, will be at CEOGC’s Central Neighborhood Opportunity Center on Wednesday, August 30 from 11 a.m. to 2 p.m.
She will be giving presentations and conducting interviews for positions at all of Dave’s 13 Cuyahoga County locations. There are many positions to fill: cashiers, bagger/cart corral, food associates and stock clerk associates. Join us at 1801 Superior Ave., Suite 400 for this event. We look forward to seeing you there!